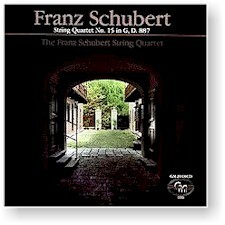 This recording represents the North American debut of the Franz Schubert Quartet. Acknowledged as one of Europe's finest ensembles, the Quartet established its reputation in the United States with this recording. Recorded in Vienna by the legendary Michael Kornhäusl and carefully annotated by Douglas Briscoe, GM Recordings is proud to present Franz Schubert's String Quartet Number 15 in D (D 887), a treat — both in performance and recording quality — for string quartet cognoscenti and general classical music lovers alike. "A wonderful surprise: the Schubert Quartet in a passionate, intense performance of Schubert's G Major Quintet." "The Viennese players ... are intent, above all, on projecting the lyrical elements — and they do so with an extraordinary refinement of tone." Recorded in February-March 1986 at Studio Kornhäusl in Vienna, Austria.